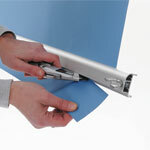 Colorama’s ‘wipe clean’ Black vinyl background can literally be used over and over again. Simply wipe away any dirt or footprints at the end of your shoot, then roll it back up ready for next time! It couldn’t be easier. Supplied Attached to a 9ft/2.75 Rolleasy Roller for insertion into an existing or new Rolleasy system. 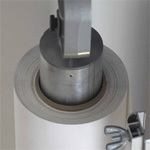 Depending on usage, we find that these will outlast, on average, 10 normal paper rolls. • Ideal for 'Low Key' photography.